This is a great playground anytime of year, situated between the shops and beach in Raumati. 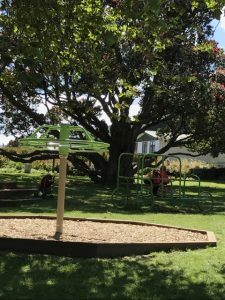 The playground has lots of equipment for all ages including a sand play area, a long tunnel slide, a bucket swing, a flying fox, monkey bars, swings and 4 person seesaw. Away from the main area, there’s also trees to climb, an old metal-framed ‘car’ and lots of grass to run around on. 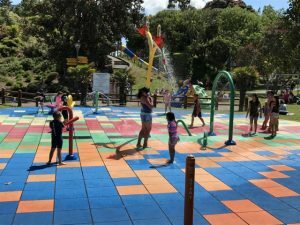 In the summer months there’s a splash pad and sometimes waitress service from a nearby cafe so you can order a coffee or other drink without dragging the kids with you. 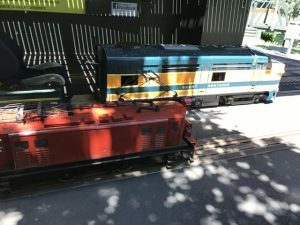 On Sundays and school holidays the mini train operates (although it is weather dependent) from 1pm – 4pm. There are steam, internal combustion and battery operated trains. The ride goes for 1km, covering 2 bridges and 2 viaducts. Train trips are $1.50/person (under 3 years free).